On the cold streets of Anchorage, Alaskan Native women are turning up dead. The police have written off this surge in casualties as random, but burned out gumshoe Lewis Bocarde isn’t buying it. There are too many “accidental” and “undetermined” women haunting the police logs who fit the same profile. Bocarde thinks a killer is prowling the streets of the city, preying on some of its most vulnerable citizens. The detective enlists the help of a troubled social worker named Grace and a band of indigenous contrarians to uncover the truth, and someone isn’t happy about their efforts. As they peel away the layers of their city to find an ice-cold killer and to deliver justice, they must come face to face with an insidious form of evil: one that twists fears and prejudice to unspeakable ends. If you like well written, roller coaster thrillers, with vivid characters who leap off the page and drink all your beer, then you will love Elvis English’s incredible, gritty journey into the heart of Alaskan darkness. 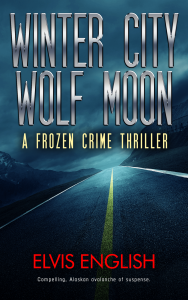 Get Winter City Wolf Moon today and be swept away by this spellbinding avalanche of icy suspense. Elvis English made his first break for freedom when he escaped from his parents on a beach at the age of four and was found a quarter of a mile away happily eating sandwiches with strangers. He has been escaping into other selves and personas ever since as a writer, photographer, traveler, teacher, musician, and a compulsive sharer of stories gathered along the road less traveled.